Sometimes projects takes hours, weeks, and sometimes even months to finish. Other times you can whip them up in 10 minutes and they turn out darling! This is one of those!! 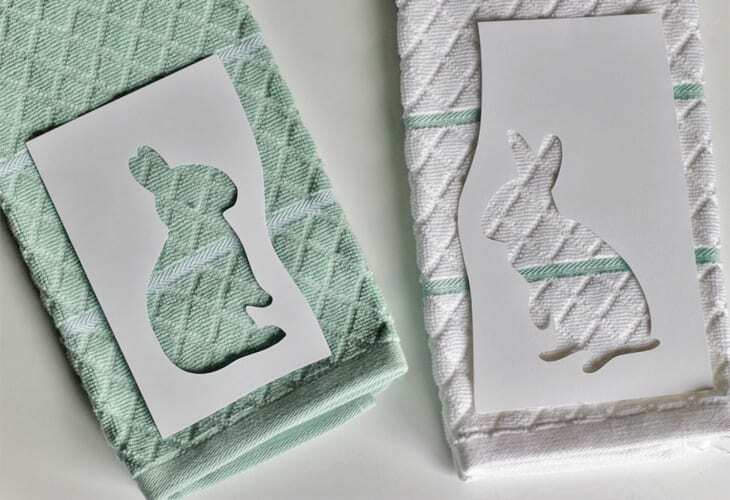 Make these simple DIY Spring kitchen towels with this FREE bunny cut file I’m giving you. 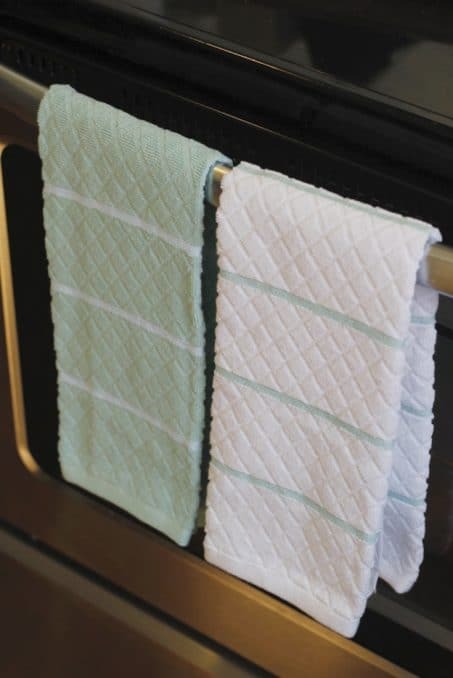 Here’s what you need to make your own Spring kitchen towels. Bunny stencil cut with your Silhouette Cameo <— hands down favorite crafting machine, get the starter bundle here! 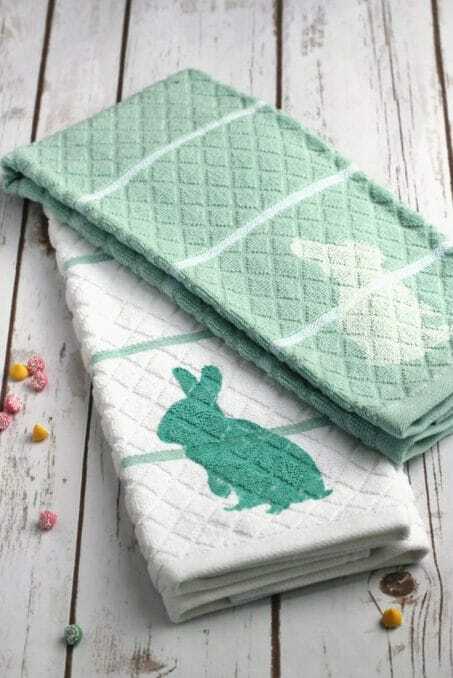 If you bought your towels new, you’ll need to first wash them before using the fabric paint on them. 1. Start by downloading this cut file I’ve provided you. If you have a Silhouette Designer Edition cutting machine you can just upload this file directly into your Silhouette program, trace the outline, and cut out your bunnies in cardstock. If you don’t have a cutting machine, print out this file and you can just cut out the shape by hand. Remember, you want to use it as a stencil so don’t cut from the edge of your paper but rather start in the middle. 2. Once you have your stencil you’ll need to find the fabric paint you want to use. I chose to go with alternating coordinating colors. The blue I found was just a little too vibrant compared to the sea foam color of the coordinating towel, but they still turned out darling! You can’t even tell they’re a perfect match unless you look really closely. 3. So start with one towel at a time. Lay your towel out flat with cardboard or cardstock under your towel in case a little paint seeps through. Find the center of your towel and place your stencil. 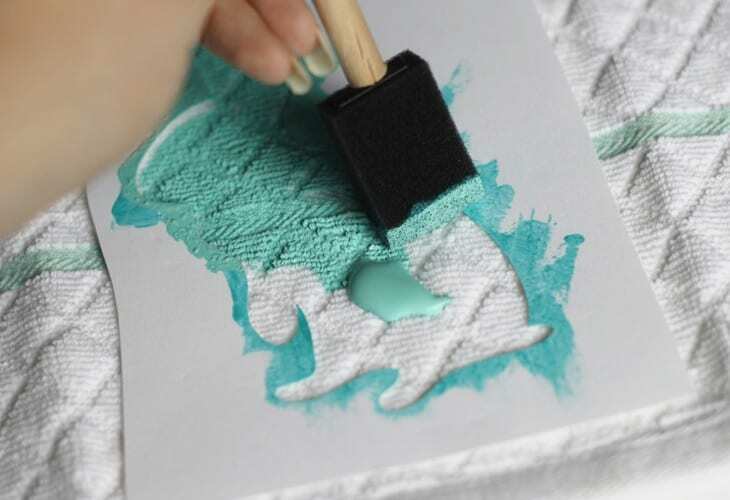 If you don’t trust yourself to keep it in the same spot while painting, you can pin the stencil to the towel using sewing straight pins or just grab some tape to hold them in place. Whenever I paint with a stencil I put paint in the middle and hold my brush perpendicular to the edge that I’m painting on as you can see in the picture below. That way there’s less of a chance that any paint will seep under the stencil. Also, pro tip…when painting with a stencil less paint and more coats is always better! 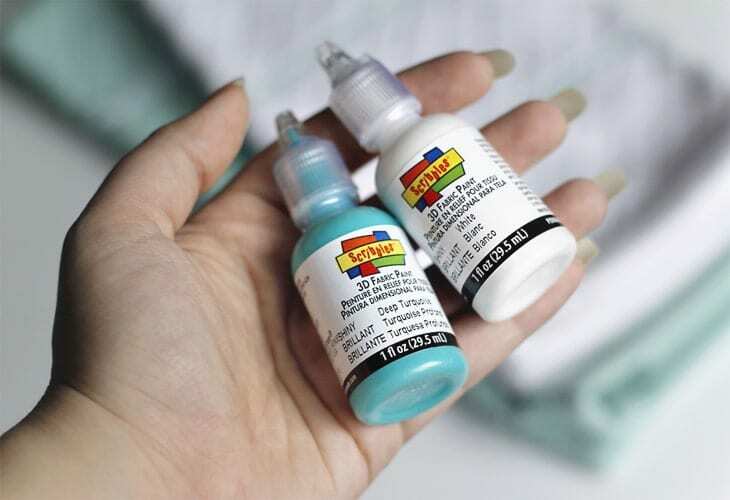 There will be less chance of smudged lines from puddled paint on the edge and a cleaner line. 4. 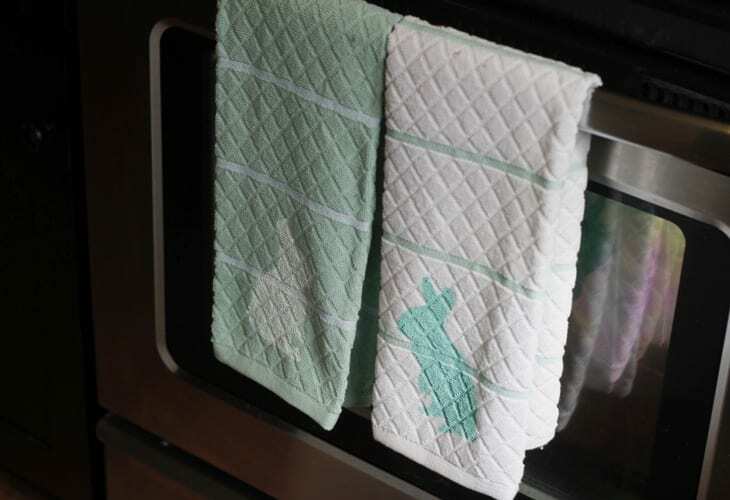 Once your little bunnies are painted, let them dry for a few hours before using them OR if you’re like me, just hang them from your oven handle and pray your little ones don’t dry their hands on the cute Spring kitchen towels before the paint has dried. And that’s it! I love how simple this project was and brought some Spring-y life into our kitchen! And just in time for Easter this weekend!! Now it’s your turn! 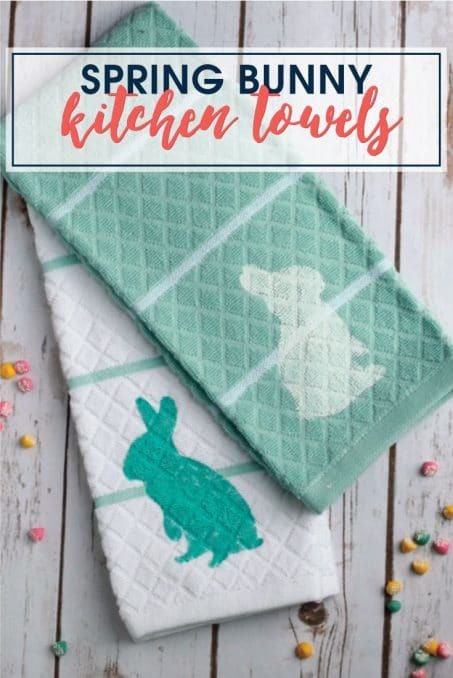 Download the file above to get started making your darling Spring kitchen towels.